The Tool is user friendly and dependable ODT repair solution. OpenOffice Writer Recovery enables restoring corrupt ODT file to transform it into a new accessible format. Moreover, the recovered data can be saved for future use. 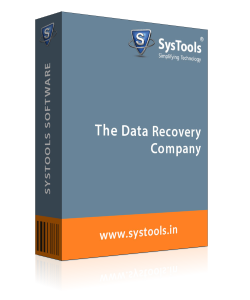 ODT files can be recovered with all their contents in place successfully using ODT recovery tool. Software does not limit to a restricted set of corruption issues to render recovery. 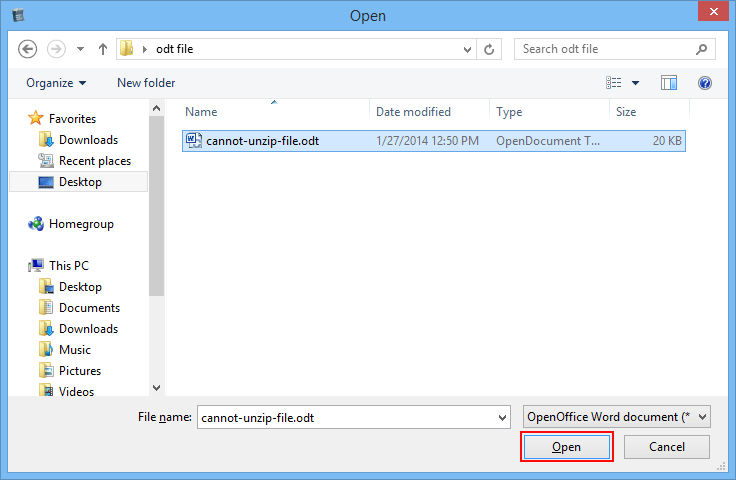 You can recover OpenOffice Writer files from all forms of damage. There are no limitations imposed by the software on the size of an ODT file. When recovering ODT files, the software does not work on a limited file size specifically. The ODT recovery software is programmed to recover Writer documents of any given size. 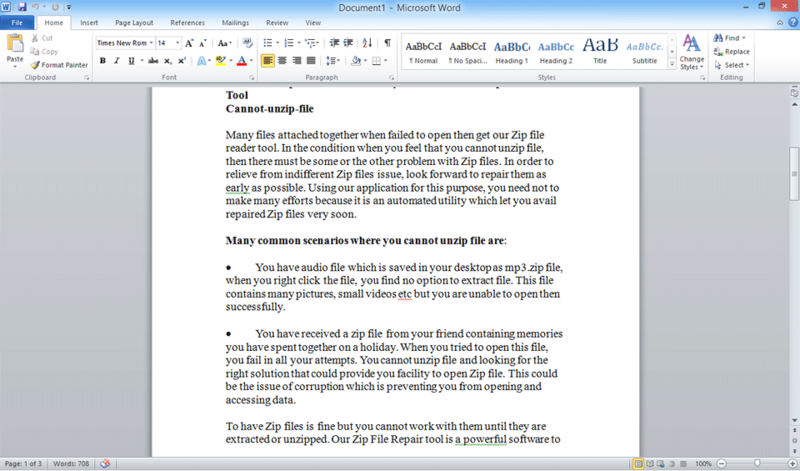 Once the document is recovered, an instant preview of its contents is generated by OpenOffice Writer Recovery Tool. You can crosscheck the document with this preview to ensure that the selected ODT file is recovered successfully with all its information in place. When recovery is performed, the document can then be saved for future use. For this, the software provides creation of a new ODT file. You can recreate the corrupt ODT file as a new one using the recovered contents during extraction. The software to restore OpenOffice Writer is programmed with another option that enables saving recovered ODT as RTF. You can choose RTF to save your OpenOffice Writer document as a Rich Text Format too and use the document otherwise. Q. How to recover ODT from an OpenOffice crash? 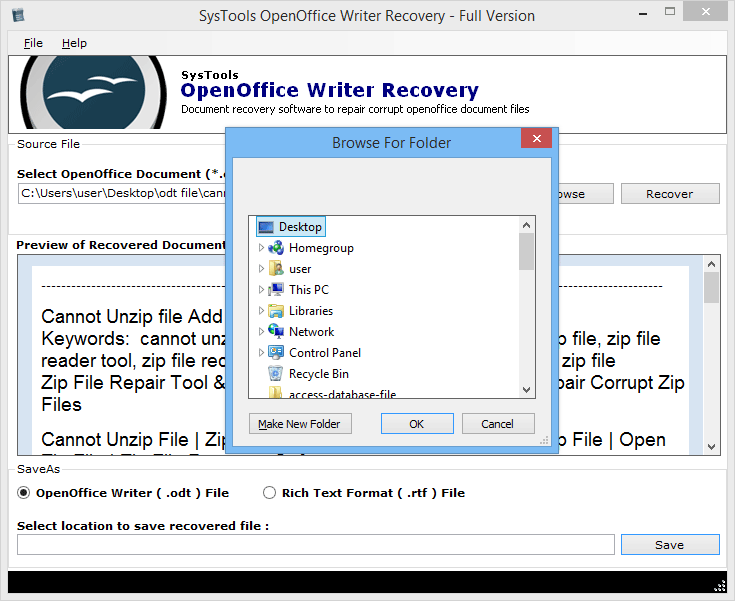 OpenOffice recovery tool is the answer to your questions. Using this ODT file Recovery tool would be productive to get ODT files recovered from an error condition. Application crash is one of the biggest reasons responsible for file corruption. Thus, the inaccessibility of your ODT file is a consequence of the same. Q. What to do if ‘document recovery' keeps repeating with no results? The error message appears because OpenOffice detected an issue and is trying to fix it automatically on its end to save you from the trouble. However, if it has become the cause of all your trouble then, you should use OpenOffice Writer Recovery Software instead. Programming of the application supports regenerating ODT without any changes made. Q. What to do if ‘document recovery’ keeps repeating with no results? The error message appears because OpenOffice detected an issue and is trying to fix it automatically on its end to save you from the trouble. 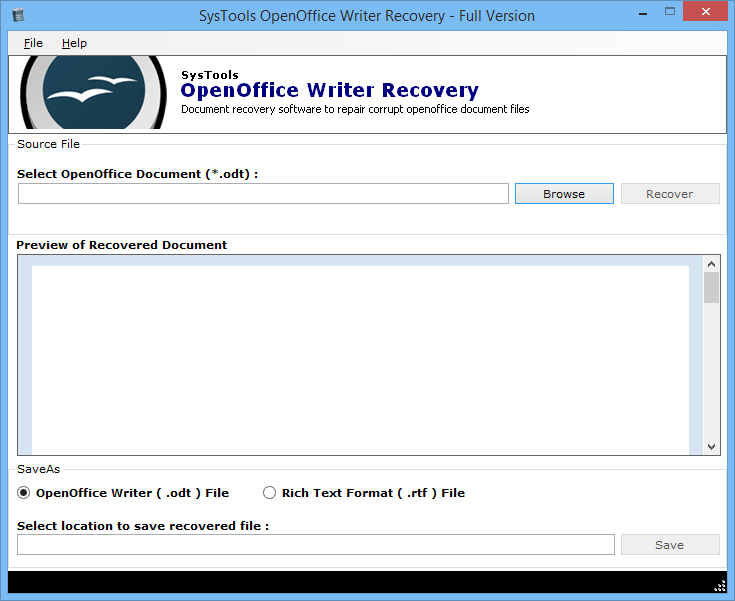 However, if it has become the cause of all your trouble then, you should use OpenOffice Writer Recovery Tool instead. Programming of the application supports regenerating ODT without any changes made. How the OpenOffice Writer Recovery Product Works? Step 2 : Click on the “Browse”, go to the ODT file storage path and select the ODT file that you need to repair and recover. 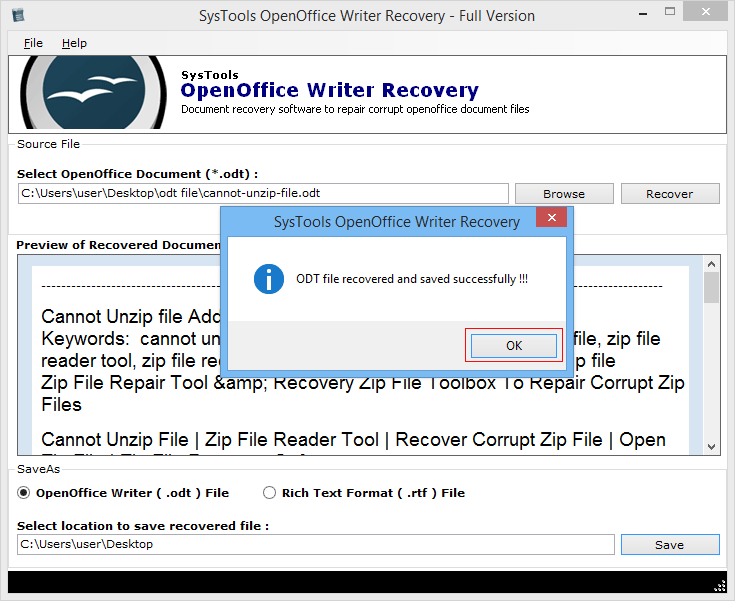 Step 3 : When You have selected the ODT file to recover and repair, click on the Open button to open the OpenOffice Writer ODT file. Step 4 : After .odt file selection, you require to do is simply click on the Recover Button for continuing restore ODT process of the file. Step 5 : The OpenOffice Writer Recovery Software is start recovering selected ODT files. 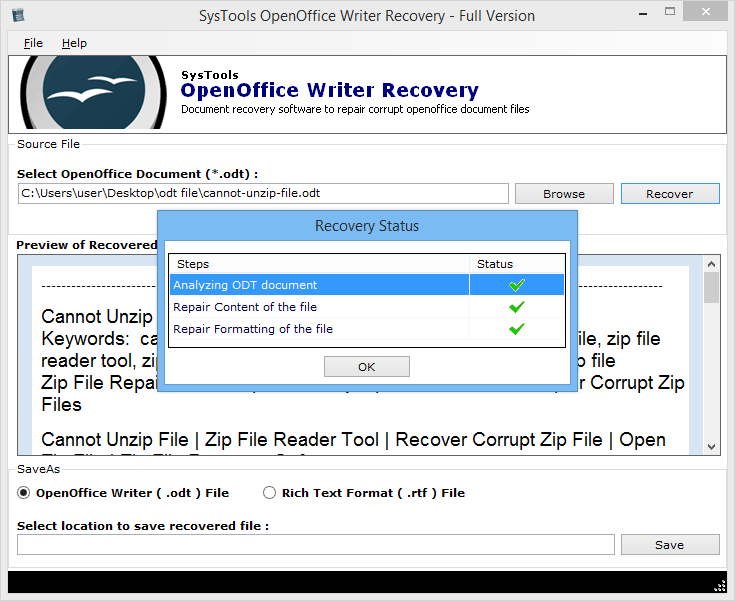 Step 6 : After the scanning process of ODT files, OpenOffice recovery tool shows the preview of restored data within the ODT file. Select OpenOffice Writer (.odt) File: To save repaired and recovered OpenOffice Writer document content from corrupt .odt safely and efficiently. Step 8 : If you want to save restored .odt file into RTF (Rich Text Format) file, choose the Rich text Format (.RTF) file. Click on Save button to save the repaired ODT in the apt file format. Step 9 : Select the location where you want to save the retrieved ODT file. Step 10 : Now click on OK Button. Now with this step, the process of Repairing corrupted ODT File completes. Step 11 : Navigate to the storage location that you had selected for saving the repaired and restored corrupted ODT file after recovery.